Scoliosis is a lateral curvature of the spine. This deformation is usually found in childhood and adolescence and is found in more than 6% of children. Girls suffer from scoliosis several times more often than boys. The most dangerous in the sense of development of scoliosis age is between 10 and 14 years. Fig. 1. S-shape of the spine in case of scoliosis of the thoracic and lumbar spine. Fig. 2. The definition of a lateral curvature of the spine: dotted - marks corresponding to the vertices of the spinous processes; direct line - a plumb. The curvature can be localized in the cervical, thoracic, lumbar, or simultaneously in several parts of the spine. The most common thoracic scoliosis. Is it right or left, with significant curvature of the spine takes an S-shaped form (Fig. 1). Scoliosis may be congenital or acquired. In the basis of congenital scoliosis is the anomaly of development of the skeleton - a child is born with a curved spine. Spinal deformity in these cases is due to anatomical defects: a wedge-shaped or incremental palpasovka, adhesion of edges between themselves or by the presence of unilateral extension of ribs, high standing shoulder blades and other more Often congenital scoliosis is localized in the lumbar and sacral vertebra and thoracic spine. Close to congenital scoliosis are the so-called dysplastic scoliosis, also related to the defects or spine (spina arms, the fracture of the lumbar and sacral vertebrae), or spinal cord. Dysplastic scoliosis is manifested not in early childhood, and with the growth of the child. Acquired scoliosis occurs as a result of diseases and injuries. There are the following forms of acquired scoliosis - neurogenic (paralytic when polio, while those of syringomyelia, disease little and others), traumatic (due to damages of the vertebral bodies, the unilateral removal of edges, rough skin scars and pleural cicatrices), static (related to improper installation of a body in different leg lengths, deformation of the pelvis, the prolonged stay in an uncomfortable position, accompanied by an asymmetric overload of muscles). A special group is called idiopathic scoliosis, when the cause of functional inferiority and curvature of the spine unable to find out. In this form of scoliosis noted the uneven growth of the vertebral bodies that the most progress in the period of rapid growth of the skeleton at the age of 11-15 years. A distinctive feature of scoliosis from other so-called functional spinal curvature are structural changes in the vertebrae and intervertebral disks. Lateral curvature of the spine in case of scoliosis often combined with kyphosis, (see) thoracic and lordosis (see) in the lumbar spine. In addition to these distortions, spine like curls on the vertical axis so that the bodies of the vertebrae are biased towards convexity and spinous processes towards concavity. The bodies of the vertebrae become wedge-shaped with the location of the wedge on the concave side. Curvature of the spine is accompanied by a significant deformation of the chest, often with the formation of the costal humpback on the convex side. Deformity of the chest leads to dysfunction of internal organs, first of all the heart, lungs, liver. The bulk of patients with scoliosis have on child and adolescent, especially of school age. Therefore, the detection of early forms of scoliosis in periodic medical examinations of schoolchildren is very important. The appearance of a patient with severe scoliosis very distinctive and it is easy to find among the masses of children; to identify earlier degrees need careful examination by a podiatrist. Early subjective sign of scoliosis is fatigue muscles of the back. 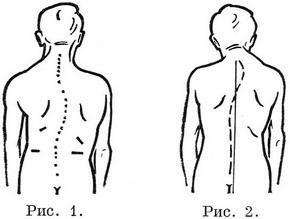 When fatigue is marked deviation of the spine from the middle line. This disease is not permanent and disappears after a rest. Over time, the lateral deviation of the spine becomes more pronounced, fixed. Most often, the curvature is located at the level of the VIII - X thoracic vertebrae. The examination should be made, completely stripped of the child, with a uniform light, to avoid sharp shadows and highlights. Note the asymmetry of the location of the shoulder girdle. Then carefully examined the line of the spinous processes of the vertebrae. OK spinous processes are strictly vertically. For greater clarity on the skin, respectively tops the spinous processes of the put paint labels and then lower a plumb (lace with a weight at the end) of VII cervical vertebra. In norm the plumb line and the line connecting the spinous processes, coincide; in case of scoliosis same line spinous processes of arc, leaning to the side (Fig. 2). For research of scoliotic spinal curvature use devices-scoliometer. The most widespread model of Mikulich, consisting of a movable horizontal and vertical metal bars with divisions that can more accurately determine the localization of the curvature and the magnitude of the lateral deviation of the vertical. X-ray researches allow to specify the type of scoliosis, to determine the degree of curvature and structural changes on the part of the vertebral bodies and partially internal organs. In the USSR made the division of scoliosis on four levels: I - deformation angle of curvature up to 175 degrees; II - up to an angle of 155 degrees; III - up to an angle of 100 degrees; IV - angle approaching direct.